Another aspect of our research addresses the dispersal potential and, hence, rate of speciation in interstitial taxa such as some annelids or gastrotrichs as little is known about these. This will also provide insights into the evolution of cryptic species as interstitial species are good models for this topic. 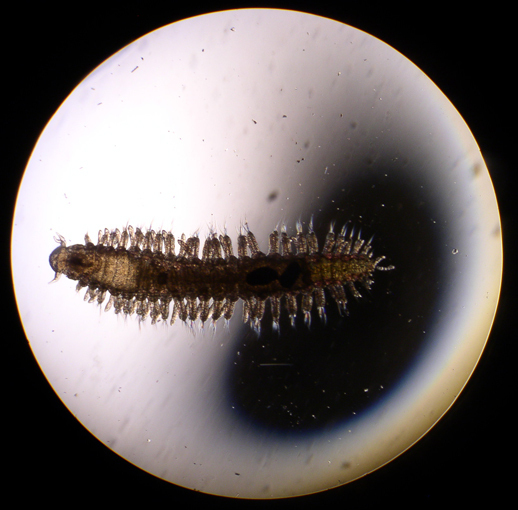 Many interstitial species possess neither good swimming capacities as adults or juveniles nor pelagic larvae and hence speciation by isolation-by-distance is generally assumed. However, results from Bachelor theses in my laboratory showed ecological factors such as grain size or influence of sea-level changes due to glaciations have a strong impact on the recent distribution and the historical extent of dispersal. However, generally little is known about the biological and ecological factors influencing the dispersal potential of interstitial taxa. In addition, some of the interstitial taxa are very well adapted to extreme environments such as methane seeps, which are characterized by extremely low oxygen and high, toxic sulfide concentrations. To unravel the evolutionary potential of worms with small body sizes we assess the dispersal potential and reconstruct events shaping the recent distribution of interstitial organisms based on a broad taxonomic scale starting with annelid taxa (e.g., Stygocapitella subterranea) and using molecular marker systems such as mitochondrial and nuclear genes as well as RAD sequencing. Using comparative studies of different interstitial metazoan general principals responsible in limiting the dispersal of interstitial species can be deduced. Moreover, such studies as well as principals allow better guidelines for conservation policies of interstitial habitats. For example, there is a strong economic interest in exploiting methane seeps as a source of natural gas, which would endanger the unique fauna inhabiting the seeps. An important aspect of these projects is also to sample at multiple geographical scales within a species or species complex and to assess ecological features of the habitat such as water saturation, content of organic matter, or grain size. Polychaetes of different taxa inhabit environments with very low oxygen concentration and extremely high hydrogen sulfide concentrations (e.g. hot spots, methane seeps, whale falls). Hydrogen sulfide, a compound highly toxic to marine life, is widespread in organic-rich, continental margin sediments where organic matter provides substrate for anaerobic sulfate reducing microbes. Sulfide is toxic to most taxa at micromolar and higher levels. Yet methane seep sediments with sulfide concentrations of 5-20 mM and little or no oxygen support dense assemblages of different dorvilleid species in high densities of >11,000 individuals per m2. Within an interdisciplinary NSF project we investigated the adaptation of such taxa to extreme environments covering the fields of biogeochemistry, physiology, ecology, and evolutionary biology. The hypothesis is that this annelid group, through exceptional tolerance to low oxygen and high sulfide concentrations, has found a niche, which it alone is able to exploit, and as a result has experienced evolutionary release in the absence of predators and competitors. Exploring mechanisms of niche partitioning including sulfide tolerance and preference, diet differences, reproductive variation, and degree of evolutionary separation we want to identify the ecological, physiological and evolutionary adaptations that allow multi-species assemblages of dorvilleids to persist under sulfide conditions that are toxic to most other species. Parougia sp. and Ophryotrocha maciolekia of Hydrate Ridge.